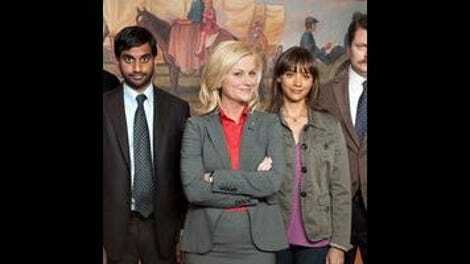 Parks And Recreation began its existence as a proposed, if vaguely conceptualized, spin-off of The Office. What’s made it to the screen has no direct connection to The Office, apart from sharing the creative team of Greg Daniels and Michael Schur. But it clearly shares a lot of DNA with its sister show. A pseudo-documentary in The Office mode, it trades Scranton for the fictional Pawnee, Indiana and a paper company for the halls of small-city government. In place of Steve Carell’s Michael Scott we have Amy Poehler’s Leslie Knope, another dreamer who experiences the real world through a highly selective filter. It’s like the same species that mutated differently in a different environment. Which isn’t to say it shouldn't thrive. For all its similarities, Parks And Recreation has a number of key differences as well, starting with Poehler’s protagonist. Where Michael continually tries to bend the world into the wonderful place promised to him by movies, television, and childhood fantasies, Poehler plays Leslie as a woman who believes everything civics class taught her about the nobility of American democracy. She proceeds through life accordingly despite evidence of bureaucratic sloth and corruption all around her. Michael generally means well and doesn’t necessarily want ill to come to others, but he wants good to come to himself above all. He treats Dunder-Mifflin as a family, but it’s primarily because he needs the comfort that way of thinking provides. Leslie talks early on about her desire to be the first female president, but she genuinely seems to want to make the world a better place, one small corner at a time. She means well. Of course, so did Don Quixote. Parks And Recreation gives Leslie a windmill immediately in the form of Lot 48, a patch of land dug out for an abandoned condo development. It’s brought to her attention by Ann Perkins (Rashida Jones), a nurse whose musician boyfriend (Chris Pratt) broke both legs falling into the pit. (That he was cutting through it in a presumably drunken attempt to find a shortcut home only becomes obvious later.) Spurred to do something about it by Ann’s earnest plea, Leslie sets out to turn the lot into a park. As a few commenters have already pointed out elsewhere on the site, this is essentially the plot to Akira Kurosawa’s 1952 masterpiece Ikiru reworked as a sitcom. In Ikiru, the great Takashi Shimura plays a go-nowhere bureaucrat who learns he’s dying. Trying to find some meaning in life before it slips away, Shimura throws himself into debauchery and despair then rallies in the face of death to turn a mosquito-infested corner of Tokyo into a playground. While I’m pretty sure that P&R’s Leslie isn’t dying, I think other comparisons are valid. She takes it as her duty to the world to spur change by fixing one small problem. True, she keeps one eye on advancing her career as she does it, suggesting it could be her “Hoover Dam.” But if her motives aren’t entirely altruistic, she’s the closest the show has to an idealist. A lot of the fun in this pilot comes from seeing how out of sync Leslie is with those around her and the way she keeps bringing others into her orbit anyway. Ann begins the show doubting her new acquaintance’s motivations and ends it a convert to the benevolent power of local government (at least for now). Co-worker, and one-time hook-up Mark Brendanawicz (Paul Schneider, a welcome addition from David Gordon Green’s stock company) begins the episode with what looks to be a longtime habit of keeping Leslie at arm’s length and ends up coming to her aid. (Whether out of pity, fondness, or a dormant do-gooder impulse remains unclear.) Aziz Ansari has a lot of funny moments as Tom Haverford, Leslie’s reluctant aide de camp. Though he treats his job as something to be endured for its access to under-the-table favors and after-hours affairs and barely restrains himself from rolling his eyes whenever Leslie speaks but still thinks fondly of her, if only for the amusing things she’ll do when drunk. (These include dressing up as Batman—“not Batgirl: Batman” and attempting to stop crimes, and making out with the water delivery guy; Leslie’s well-developed libido looks to be a running gag.) Finally, Nick Offerman plays Leslie’s boss, who sits beneath a poster of Bobby Knight and makes his feelings about government known to anyone who asks: He doesn’t like it and wishes it would go away in favor of a privatized model that runs as smoothly as Chuck E. Cheese. The conflict between Obama-inspired civic engagement and laissez faire government neglect makes this feel like a show to fit the times. Two other things are worth noting: The show’s very funny and it’s not all the way there yet. It’s probably too much to ask of a pilot to arrive fully formed, but nobody here quite seems to have enough notes to play. It feels like we’re getting outlines to be filled in later. That said, this first episode has considerably more laughs than the pilot for the American Office, most of which I’d only spoil by trying to re-create here. And, unlike The Office, it features a central character with a goal that gives viewers a rooting interest. It’s impossible not to feel for Michael Scott, but Leslie Knope has a genuinely noble aim. She may be deluded about its importance in the grand scheme of things, but it’s a dream that would be nice to see come true. If realizing that dream also means antics as funny as this outing’s drunken singalongs and hardhat-padded pratfalls, all the better.